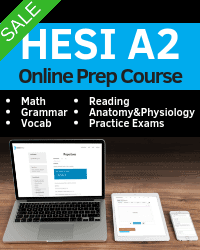 HESI Practice Tests are an ideal way to prepare for your upcoming HESI A2 exam. In order to get into your chosen nursing school, you will need to score well on the HESI, making HESI study guides and practice tests essential prep materials. Our directory of free HESI A2 practice tests are listed below, providing you with a thorough list of sample questions to help you study for your entrance exams. Our free HESI Admission Assessment sample tests supply you with an opportunity to assess how well you are prepared for the actual HESI A2 exam, so you can then concentrate on the areas you need to work on. Give yourself a leg up with our 2019 HESI practice tests! SPECIAL OFFER: Discounted HESI Prep Course! HESI Math – Review of all HESI math topics and 200 practice questions. HESI Grammar – Complete grammar review with practice questions. HESI Vocabulary – Study 250 HESI vocab terms with flashcards and practice questions. HESI Reading Comprehension – Reading tips and strategies with 5 practice reading quizzes. HESI Anatomy & Physiology - Thorough review of all A&P topics and 4 full-length practice tests. 3 Full-length Practice Exams – Timed exams with complete answer explanations. HESI stands for Health Education Systems Incorporated, the company which offers the HESI A2 exam for student nurses. The HESI A2 entrance exam is formally referred to as the Evolve Reach Admission Assessment Exam. The HESI exam consists of a total of 10 different exams, covering the following areas. Math - This is a 50-question exam with a 50-minute time limit. This portion of the HESI exam evaluates a student’s math skills as related to health care. Math skills that are tested include: addition, subtraction, multiplication, division, ratios, proportions, fractions and decimals. A large portion of the exam includes conversions, household measures, and dosage calculations. Reading - This is 47-question exam with a 60-minute time limit. The reading comprehension HESI exam measures a student’s capability to understand reading passages. These reading passages will typically be health care related. Students are required to identify a primary theme, find the meaning of phrases in context, determine logical inferences, and understand reading passages. Vocabulary - This is a 50-question exam with a 50-minute time limit. In this HESI exam, students are tested on their grasp of various health care related terms. Grammar - This is a 50-question exam with a 50-minute time limit. Basic grammar principles are evaluated in this HESI test. These grammar principles include important terms, their uses in grammar, common grammatical errors, and parts of speech. Biology - Typically given if biology is a required pre-requisite, this is a 25-question exam with a 25-minute time limit. The biology test portion of the HESI exam covers metabolism, cells, cellular respiration, photosynthesis, biological molecules and biology basics. Chemistry - Typically given if chemistry is a required pre-requisite of your nursing program, this is a 25-question exam with a 25-minute time limit. The chemistry portion of the HESI exam covers the periodic table, atomic structure, chemical equations, chemical bonding, nuclear chemistry and matter. Anatomy and Physiology - Usually required if anatomy and physiology is a pre-requisite, this is a 25-minute exam with a 25-minute time limit. The anatomy and physiology portion of the HESI exam covers anatomical structures, general terminology, and systems. Physics - Usually required if physics is a pre-requisite course for your school, this is a 25-question exam with a 50-minute time limit. The physics portion of the HESI test evaluates a student's understanding of the following topics: rotation, gravitation, Newton's Laws of Motion, average speed, acceleration, projectile motion, light and optics, and energy. Schools can choose to administer any of the HESI exams to assess a potential student’s fitness for their program. Most schools choose to focus on the math, reading, vocabulary and grammar tests as a way to evaluate a student's readiness. Concentrating Your Study - The more practice tests you take in your prep for the HESI exam, the better grasp you’ll get for the topics that you know well and the areas that you are weak on. Many students waste a lot of valuable study time by reviewing material that they are good at (often because it is easier or makes them feel better). The most effective way to study is to concentrate on the areas that you to work on, however. Strengthening Your Problem Solving Abilities - As you prep with our HESI A2 practice test sample questions, and review the provided explanations, you will increase your ability to solve problems. Solid problem-solving skills will be crucial for you to achieve a passing score on your HESI exams, especially the mathematics portion, so getting in plenty of HESI practice is essential. Understanding the Exam Format - Every standardized test has its own unique format. As you take practice HESI tests you will become comfortable with the format of the actual exam. Once the test day arrives you will have no surprises for the actual HESI A2 exam! Improving Your Speed - The HESI A2 exams are all timed. Although most students who take the exam feel that there is sufficient time, taking the HESI A2 practice tests with self-imposed timers helps you budget your time effectively. Studies have shown a strong correlation between HESI A2 scores and first semester course grades, and ultimately nursing program completion. Each nursing school chooses which of the subject tests (e.g., math, anatomy, etc.) that its prospective students need to take. After a student takes the HESI A2 exam, the institution will receive two types of scores: individual percentage-based scores for each subject exam and an overall composite score for all of the exams that were taken by the student. Each nursing program determines its own requirements for admissions – there are no minimum passing scores set by the exam creator (Elsevier). Elsevier and many institutions, however, do believe that a minimum composite score of 75% and a minimum individual exam scores of 70% are required for a student to be successful in their nursing program. 90% to 100% (Excellent) - This indicates a student has at least a tenth-grade reading level. The student is capable of reading and understanding typical nursing textbooks. 80% to 89% (Very Good) - This indicates a student will most likely be successful in nursing school, but may require additional reading time for comprehension. The student will also spend more time determining the meaning of terms that they do not know. 75% to 79% (Satisfactory) - This indicates that reading assignments will be harder and will require more time for a student. The student may require additional tutoring. Below 75% (Needs Improvement) - This indicates a student will require more formal help in reading and vocabulary prior to entering the nursing program. 90% to 100% (Excellent) - This indicates a student demonstrates the ability to calculate all levels of medication administration. 80% to 89% (Very Good) - This indicates a student is capable of calculating basic medication administration but should seek help to calculate higher-level calculations. 75% to 79% (Satisfactory) - This indicates a student will need assistance in performing medication calculations. Below 75% (Needs Improvement) - This indicates a student will require formal math remediation, either prior to entering a nursing program or with entry-level courses. 90% to 100% (Excellent) - This indicates a student is fully capable of producing grammatically correct writing assignments with little difficulty. The student should be capable of understanding typical nursing textbooks. 80% to 89% (Very Good) - This indicates a student is capable of completing a grammatically correct writing assignment. A student may, however, require that the assignment be proofread prior to submission. 75% to 79% (Satisfactory) - This indicates a student may struggle with grammar with both written assignments as well as verbal communications. A student would find outside help with English and grammar to be beneficial. Below 75% (Needs Improvement) - This indicates a student should attend an English/grammar remediation program prior to entry into a nursing program. 90% to 100% (Excellent) - This indicates a student is fully capable of reading and understanding a typical nursing textbook. 80% to 89% (Very Good) - This indicates a student should comprehend most of the information in a nursing textbook, but may need to spend more time on more complex topics. 75% to 79% RN/70% to 79% PN (Satisfactory) - This indicates a student may struggle to keep pace with heavy reading assignments. Below 75% RN/Below 70% PN (Needs Improvement) - This indicates a student will require more formal help in reading. These tests attempt to evaluate a student's understanding of the subject matter. These tests are typically given if a nursing program requires a given subject as a pre-requisite. 90% to 100% (Excellent) - This indicates a student displays a thorough knowledge of the subject. The student should demonstrate success in the sciences required of a nursing program. 80% to 89% (Very Good) - This indicates a student should be well prepared for entry into a nursing program. 75% to 79% (Satisfactory) - This indicates a student demonstrates satisfactory knowledge of the subject, but may require additional assistance and/or tutoring. Below 75% (Needs Improvement) - This indicates a student requires remediation or needs to retake the subject prior to entry. Best of Luck with Your HESI A2 Practice Tests! HESI practice tests are one of the most effective ways to study for your nursing entrance exam. The sample questions in our HESI practice exams will give you a feel for how the actual test will be delivered. In addition, utilizing HESI study guides will give you the key prep you need to succeed. Good luck on your HESI A2 exam, and be sure to browse our site for more reliable practices exams, study guides, and resources for a variety of other tests!